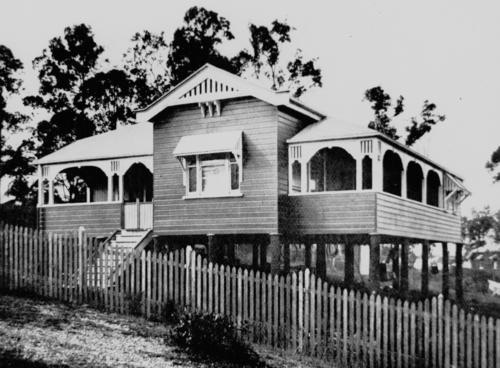 A blog dedicated to restumping Queenslander and other timber homes. These buildings will most likely cease to be built one day, the timber and craftsmanship should be preserved and treated with pride. Time to wind the clock back and look at things a little differently. I have explained how to do a re-stump direct with minimal support however if we are lifting lowering or repositioning the building we need to go about things differently. Counter balancing still playing a large role as it does constraining or moving any heavy object with minimal effort. In the illustration or sketch following there is a network or grid formed from steel RSJ beams. Although the grid supports the building or load as I will refer it to, it still needs to be counterbalanced to keep the weight and material size at a manageable level and equally important the building needs to be kept on a flat plane and not drooping in places. 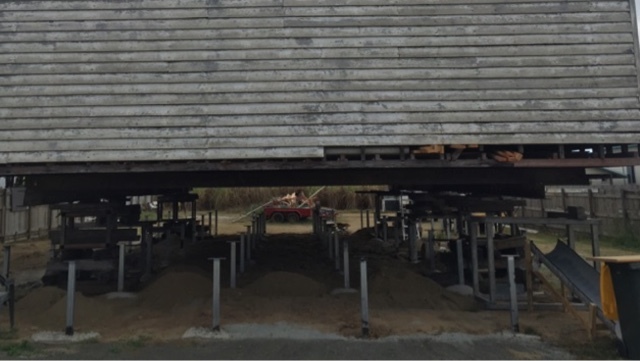 This is important for a couple of reasons, the first of these is when it comes time to hanging the posts the building needs to fall into a 25-50mm clearance between the level point at which the post will sit and the height of the building while it supported. The second to avoid extreme pressure point where the weight of the load is transferred to a singular point. For this reason you will need to do some pre thought and preparation. Internal walls, condensed building such as robes and cupboards will put extra weight in places and this needs to be considered. Usually what we call lifting steels are placed first. These lifting steels will run long ways under the building and out to the edges to the point where counterbalance is achieved when the cross steels shown in the sketch are lifted up under the house, roughly a metre in for an 8-9M wide building will be fairly close. They need to be as far out to the edges as possible without compromising the desired counterbalancing. The further out they are the lighter the lift but to far out and these benefits are very soon out weighed. That is if they are to far out to the edge they will bend and bow and if there to close to the centre extreme amounts of weight will be endured as you are attempting to lift the whole weight of the building from one point. Once the frame is constructed it can be lifted up to the house supporting the lifting steel with frames and sties. 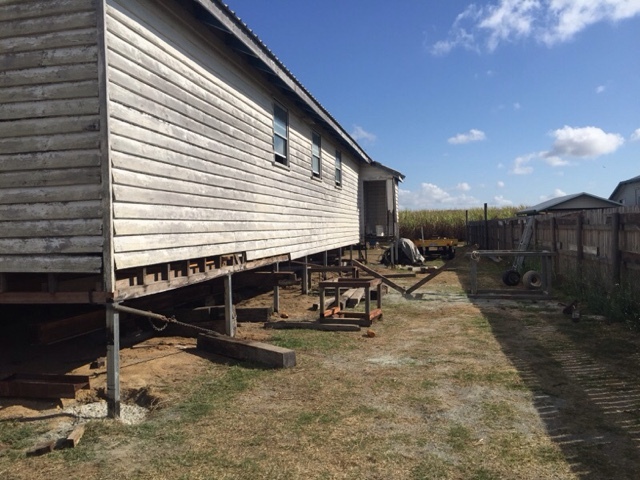 The building can then be lifted off the post, the post removed and the house can be lifted or lowered in place. There are at least two ways you can go about putting new stumps under at this point. 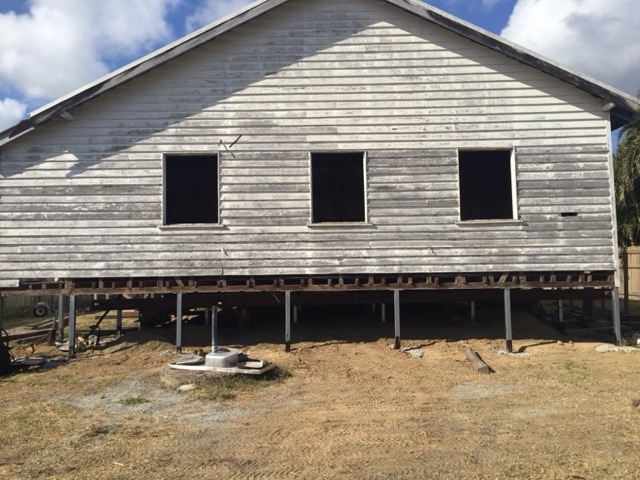 If the building is in reasonable condition and the bearers can be drawn out on a plan accurately then you can set up forms and string lines and concrete the posts in with the building up higher out of the way, however my advice and certain the most forgiving methods is to restump in the same manner we earlier described in "Hanging by a thread". Hydraulift. Awesome Inc. theme. Powered by Blogger.